Our boat “West Cape” is a heavy 33′ fiberglass fishing boat built by Bounty Motor Yachts in Medford, Oregon. 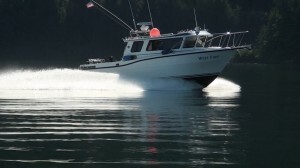 It was custom designed from the bottom up for charter fishing Alaskan waters. It is powered by twin 370hp Yanmar Marine diesels. She is fast and extremely stable. The large single level pilothouse has lots of comfortable seating for your group. Private stand up head (bathroom), hot and cold sinks, and heated cabin are just a few features that will help to make your fishing trip relaxing and enjoyable. She has a full suite of top of the line Garmin electronics to help us stay on the fish as well as safely navigating to and from the fishing grounds. Bella Misty Fishing Charters and “West Cape” are owned and operated by Capt. Clayton Moore. He carries a USCG 100 ton Masters Near Coastal license and for the last thirteen years has been registered fishing guide with the Alaska Department of Fish and Game. He is a member of the International Game Fish Association and is an officially designated IGFA Captain. Captain Moore is a seasoned offshore angler. He fishes year around in both freshwater and saltwater, targeting bottom fish as well as pelagic species using trolling, live baiting, downrigging, and jigging/salmon mooching techniques. All of these skills are used at different times to help you catch fish. Capt. Clayton will meet you when you arrive and take you out on your fishing adventure. 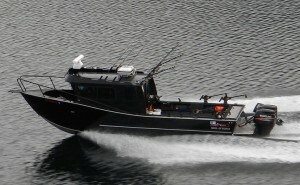 Our Ketchikan charter fishing boat “OUTCAST” is a 2011 33′ Sea Storm built by Fish-Rite in Medford, Oregon. She is unique in many aspects. Outcast was customized by Captain Ryan specifically to fish in SE Alaska. A beautiful vessel and her amenities have been called “spartan”. She was not built as a pleasure cruiser, but instead as a blood-thirsty fishing machine. In the cabin, there is a stand up head and seating for 6. Outcast stands apart in more ways than her aluminum hull and black paint. She has a huge fishing platform. Loads of room on the deck for your group to move around while we are fishing. With 500hp, Outcast is extremely fast when the situation calls for it. At up to 46kt (52 mph) she provides a comfortable, quiet ride, and can add additional fishing time to your trip by getting to the fishing grounds quickly. She is equipped with some of the newest, high end electronics from Garmin, such as a mapping gps, dual frequency sonar, 72 mile HD Radar, VHF radio, XM satellite weather and radio, and wireless autopilot. She carries safety equipment that exceeds USCG standards such as a life-raft and EPIRB. The fishing gear aboard is all business as well. Top of the line Lamiglas rods and Shimano reels, electric downriggers, and all the tackle needed to make your fishing trip successful. Best Weigh Guide Service and the vessel “OUTCAST” are owned and operated by Captain Ryan McRobert. 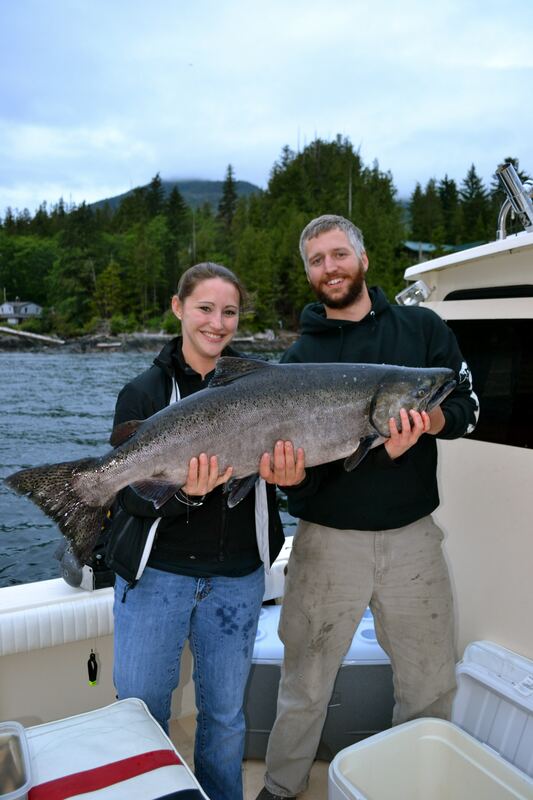 Captain Ryan has been sport fishing for King and Silver salmon since the age of 10 and Halibut since 18. He has fished the West coast from Northern CA to the Kenai Peninsula, and out to Kodiak. In 2014 he and “OUTCAST’ fished Kodiak Island Alaska and learned just how much rough water they can take. He holds a Near Coastal OUPV Coast Guard Captains license and has targeted fish offshore, the inside passage, and in freshwater. Combining the skills needed for all types of fisheries, Capt. Ryan is serious about bringing fish to the boat while providing a fun atmosphere and overall experience. When you book your 2015 fishing trip aboard “OUTCAST”, Captain Ryan will meet you, be your guide, and handle all aspects of your charter. “Ko’Olina” is a 32′ Charter Vessel built by SeaSport in Bellingham, Washington. She is built with an extended cabin for more room and comfort while traveling to the fishing grounds. SeaSport has built a great reputation on solid performing, smooth riding boats and “Ko’Olina” is no exception. She has a very warm, heated cabin, room for 6, a private head, and excellent seating right with the captain. Tall, comfortable bench seating in the cabin provides her passengers with a nice ride, and a great view of the scenery outside. “Ko’Olina” is equipped with top of the line Shimano fishing gear, and fishing tackle from top manufacturers. Captain Jim Parrott is a born and raised Ketchikan fishermen with a long family history of commercial and sport fishing in Southeast Alaska. After spending 10 years working for the family commercial fishing business, captain Jim decided to move into the charter fishing world and has been happily doing so for the last 9 years. After being a hired captain running 7 different charter boats for other people, Jim bought Miss Parker and eventually Ko’Olina, and has been very happy as his “own boss”. Running so many boats has given Jim loads of knowledge about how to operate different vessels and how to catch fish in different circumstances on the water. When you book your salmon charter on “Ko’Olina”, Capt. Jim will meet you, be your fishing guide, and deliver your fish to be processed. Killin’ Time is a 31′ Silverton powered by twin 330hp engines. She has a stand up head, open, spacious salon, and plenty of deck space for your whole group. 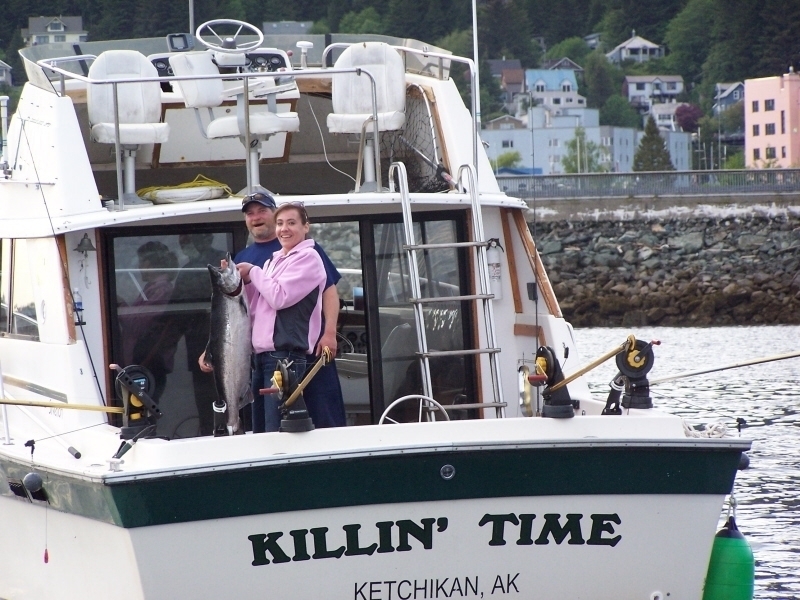 She boasts a stable, comfortable ride, and all the equipment to take you on your salmon or halibut fishing adventure. 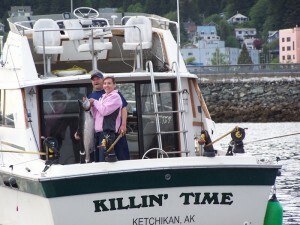 Killin’ Time also boasts another great trait…her owner/captain Clay Slanaker. Clay is a lifelong Alaska resident, and has guided in Ketchikan for hundreds of years. Clay loves to teach his guests how to fish rather than showing them that he knows how to fish. Clay has fished from Juneau to the Canadian border and targets and catches halibut and salmon with the best Captains around! We had the time of our lives and want to thank you. You are by far one of the best guides we have used. You put us on fish, coached us and provided top notch equipment – how could we not be successful. It was a pleasant surprise to see our photos in your gallery. Bob, Daleand John W.
Hi Clayton, how are you ? Quick note to thank you for a wonderful time fishing with the boys. Now that we are home and kinda settling back into our routine we’ve asked them a few times, what their favorite part of the trip was and Jensen is the first one to say : FISHING !! Ingrid C.
Hey Captain-Thanks again for an amazing charter! Just wanted to include these pictures and let you know that we received our fish and they are delicious. And if you or your wife get a spare minute, Bob reminded me to ask you for your salmon dip recipe………Happy Fishing to you!! Sandy P.
Our photos have been shown to anyone willing to give us the time. We were all so very impressed with with every aspect of the afternoon. Your professionalism has been applauded repeatedly. Ryan, Your fishing area was by far the best in SE Alaska, as the farther we went north the more congested the best areas became with lackluster results. Take care and God Bless.